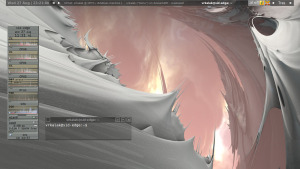 I don't change much on my KDE desktop. I change the theme to Oxygen soon after an install. I add a few app buttons to the panel and the panel remains on the bottom by default. For wallpapers I use the default desktop setting with a slideshow from a folder of wallpapers I've download over the years. Nothing fancy. A lot of bells and whistles don't help me work better, so I don't add a lot. Nothing against those who do. KDE works for me and my decorating standards work for me, too. Boring? Oh well. - Conky based on VinDSL (on Ubuntu forums) which I tweaked to add support for moc player album art and track info. 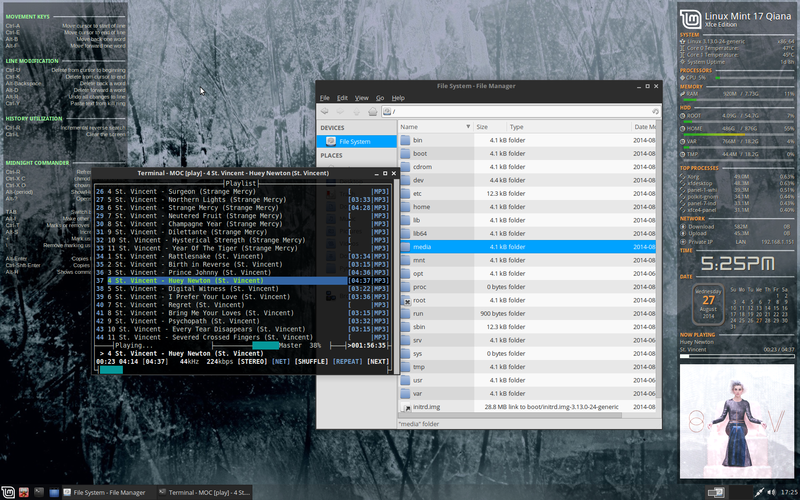 - Theme based on Numix Holo tweaked to correct some GTK3 panel issues. - Faenza Azur icons theme. How theme and icon name? Still a bit of experimenting with LM17/Cinnamon. All my computers are in Mint condition.